I think it’s only now that the full impact of the Obama administration is actually starting to dawn on me. While we lived through it, people like me were mired in everyday crises. We couldn’t keep up with the insanity. It was just so overwhelming – from the crazy personnel appointments, to the destructive policy ideas. Sometimes I actually wonder how the U.S. survived those eight years. But, lately, I really think one name personifies the scariness of those years – especially the way our national security infrastructure was compromised. That name is John Brennan, Obama’s amazing choice for CIA director. This was the CIA director. It’s eerie now just to reflect on that. What a dangerous time we somehow managed to survive as a nation – perhaps by the skin of our teeth. May we never face such a threat again. How could such a man even get a security clearance in the U.S. government, let along become CIA director? And, of course, if we want to look at his shocking history, all we need to do is consider for whom he voted in the 1980 U.S. presidential election: Communist Party USA boss Gus Hall, an unregenerate Stalinist. Keep in mind, the choice in 1980 was between Ronald Reagan and Jimmy Carter. 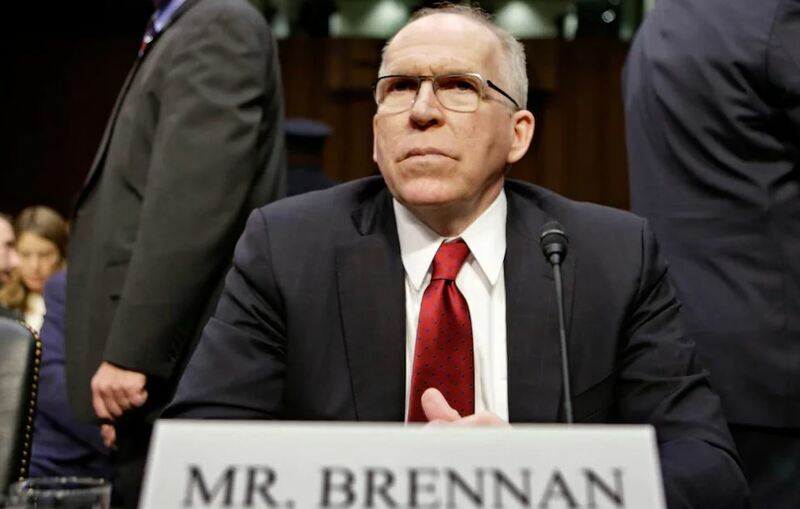 Evidently, John Brennan thought Carter was only a socialist squish and determined to vote for the hardline Communist with a capital C. You would think an admission like that would keep him from getting a security clearance or at least prompt a mandatory psychological review for someone applying for a job at the CIA. But no. He went on to become director 28 years later. Not only did he vote for Hall, he has suggested he was actually a member of the Communist Party at the time. Think about that. At the time, the Communist Party USA was a paid foreign agent of the Soviet Union. And he’s suggesting Trump is a patsy of Russia? Has he ever renounced Communism? Has anyone in the press ever asked? Then there’s the air of mystery about his passion for Islam. he made the Hajj to Mecca, which is supposed to be something only Muslims do. He said he was paying homage “to the majesty of the Hajj,” but only Muslims are permitted to make the journey. If one respects and reveres the majesty of this annual ritual, why would that person break Islamic law? Brennan once came under investigation for perjury because he had, under oath before the House Intelligence Committee, testified that the infamous anti-Trump “dossier” funded by the Democratic Party played no role in the intelligence community’s publicly released conclusion that Russia interfered in the 2016 election. Brennan further declared he did not know who commissioned the opposition-research document, even though senior national security and counter-intelligence officials at the Justice Department and FBI knew the previous year it was funded by the Hillary Clinton campaign and the Democratic National Committee. These are indeed bald-faced lies he told under oath. Such lies were not unusual for Brennan, as this report meticulously documents. That’s how corrupt and bad the Obama administration was. It was an eight-year-long national security nightmare, a scandal of epic proportions. And no single individual personifies that more than John Brennan.